You may have heard a lot lately about the keto diet, which has taken the internet by storm via countless Pinterest recipes, Instagram food share posts and a very popular keto-related subreddit. 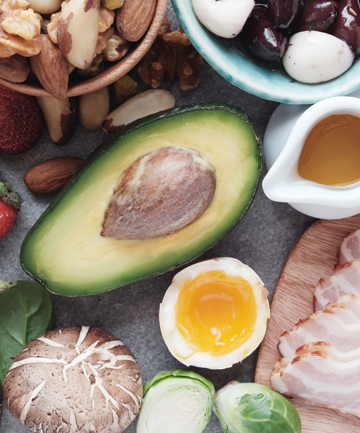 But if you aren't really sure what keto is or if it's right for you, here's everything you need to know about the diet everyone seems to be doing these days. According to registered dietician Paul Salter, the keto (or ketogenic diet) is a high-fat, moderate-protein and very-low-carbohydrate diet intended to place one in a state of ketosis, a metabolic state in which ketone bodies, rather than glucose, become the preferential fuel source. Salter explains that the diet was first introduced back in the early 20th century as a way to treat epilepsy and an alternative approach to fasting, which many people at the time found challenging. Because the diet was high in fat while restricting carbs, Salter says it was known to produce the same metabolic changes as a fasted approach. Fast forward to the 21st century and it's safe to say that keto is definitely gaining some newfound popularity because, like many other popular diets out there, Salter says the lifecycle of keto research is finally making its way to mainstream media with solid research to back up the benefits. If you are interested in giving the keto diet a try, it's always important to do so with the guidance of a professional. However, here are some dos and don'ts to keep in mind if you are already trying to bring some keto meals to your plate.